Here is a little appetizer I made a few weeks ago utilizing some matsutake mushrooms which are very limited and normally very expensive because of the lack of abundance in the wild. It sometimes can be called a pine mushrooms because they normally grow at the base of a variety of pine trees. The matsutakes have a firm, meaty texture with a earthy flavor. In this recipe I thought it would be fun to pair the matsutake mushrooms with pine nuts. 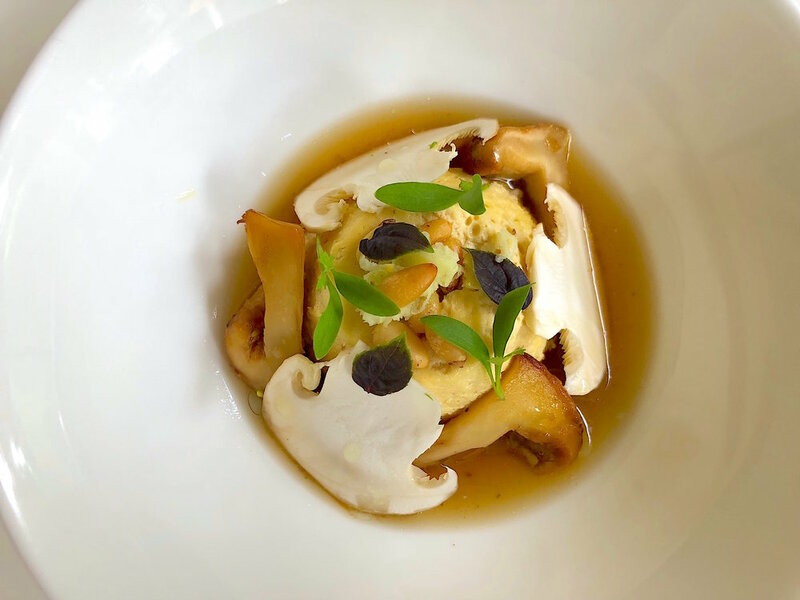 I thought a warm savory custard with cooked and raw matsutake would go great with a smoked beef/mushroom broth. Topped with a little fresh wasabi. This was a fun dish that was loved by Jp and Eloise. Here is the recipe I hope you enjoy it! Place cream and roasted pine nuts in a pot and bring to a boil. Once it has come to a boil place in a vita mix and puree until smooth. While the blender is on add the eggs one at a time. Adjust seasoning with salt and pepper. Strain (if desired) and pour into 6 small ramekins that have been sprayed or buttered. Place the ramekins into a baking dish and fill the dish half way up the sides of the ramekins with hot water. Cover with foil and bake 17-19 minutes or until the custard has just set. Take out and let it cool. Place the custard back in the oven just for a 3-4 minutes to warm back up. Meanwhile in a small sauce pan add olive oil, butter, and quartered matsutake. Cook for 4-5 minutes and season with salt and pepper. Using a paring knife run your knife around the the inside wall of the ramekin. Flip the pine nut custard into the bowl. Add the cooked and raw mushrooms to the dish. Add a small fresh grated wasabi on top of the custard. Add the smoked bone broth and some herbs. Serve and enjoy! Here is a classic combination of strawberries and rhubarb that is probably as old as the ingredients. This is typically a summer recipe depending on the harvest of each ingredient. A lot of times though you can get more than one harvest especially if you live in California. I know also you can get strawberries all the way into November and December in Texas as well. Nothing too fancy here just straight forward classic flavors. Here is the recipe I hope you enjoy it! Place all the ingredients in a bowl except for the shaved rhubarb. Mix well with a spoon. Then spoon in the filling inside the pre-baked tart shells. Optional, take the shaved rhubarb and weave or braid on top of the pie filling. Then place in a 375 degree oven for 40-45 minutes. Take our and cool. Take some powdered sugar and sprinkle on top of the tart. Take a little crushed up cookie like (biscotti, graham cracker) and place on the plate. Take a scoop of the rhubarb sorbet and place on top of the crushed cookie (this helps anchor the sorbet so it doesn’t slide all of the plate). Serve and enjoy! “Lobster and Potato” This is the vegetarian version using lobster mushrooms instead of actual lobster meat. These mushrooms not only look like the lobster meat in color before they are cooked but they have a very meaty texture as well. This is a great vegetarian dish with the exception of a meat broth. Obviously you can exclude that part of the recipe if you are a true vegetarian but Jp and Eloise both don’t mind broths and aren’t strictly vegetarian. It allows this recipe another layer of deep and rich flavors. Here is the recipe I hope you enjoy it! De- bone 3 whole squab. Brown bones on a sheet pan in an 400 degree oven for 30-45 minutes. Then take vegetables and brown in a stock pot with a little bit of olive oil until they are caramelized (10 minutes). Add garlic and herbs and cook for another minutes. Then add bones to the pot and deglaze the pan with some water to get all of the bits from the pan off and pour into the pot as well. Fill the pot with the rest of the water. Bring to boil and turn down to a simmer. Reduce by 3/4. Season with salt, strain and set aside. Keep warm. Trim the mushrooms of tough stems if any and any dirt that may be on them. Cut large mushroom into pieces and keep the small ones whole. In a pot add the oil, bay leaves, thyme, rosemary, and verbena. Bring the oil up to 170 degrees. Then pour in the mushrooms carefully. Turn the mushrooms periodically. When the oil comes back up to 170 degrees cook for another 5 minutes. Then turn off the heat and add the vinegar, salt and pepper. Let the mushrooms steep in the oil for 45 minutes. At this point you can serve them or keep them warm or conserve them by transfering to a container and keep in the refrigerator. The mushrooms should be submerged in the oil. Serve the mushrooms hot or cold and they will keep for a month. Place leek tops in boiling salted water and cook until tender but still vibrant green (approximately 3-5 minutes). Meanwhile heat up cream in a small pot. Strain the leek tops and place in the vitamix with the hot cream. Puree until smooth, while the blender is still running add the butter. If the sauce is a touch thick you can thin out with a little of the blanching water. Season with salt and keep warm. Take the lobster confit mushroom and place in a 400 degree oven for 5-7 minutes. Meanwhile in a medium saute pan on medium high heat add butter, olive oil, and all of the parisienne blanched vegetables. Add thyme, salt, and pepper. Cook for 3-5 minutes until they are tender and hot. Take the leek sauce and place in a squirt bottle. Make a oval shape on the plate. Add the duck jus inside the oval. Then place the parisienne vegetables in the middle. Take the mushrooms out of the oven and place on top. Finish the dish with some fresh herbs, in this case it was oregano. Serve and enjoy! Here is one of 6 courses I served from the Bloomingdale/Frans Drescher dinner. This was later in the summer when all of the melons are at the peak of ripeness. The Gala melon that was available during this time frame was absolutely amazing. Sweet, but still firm, none of that mushy texture when melons become over ripen. 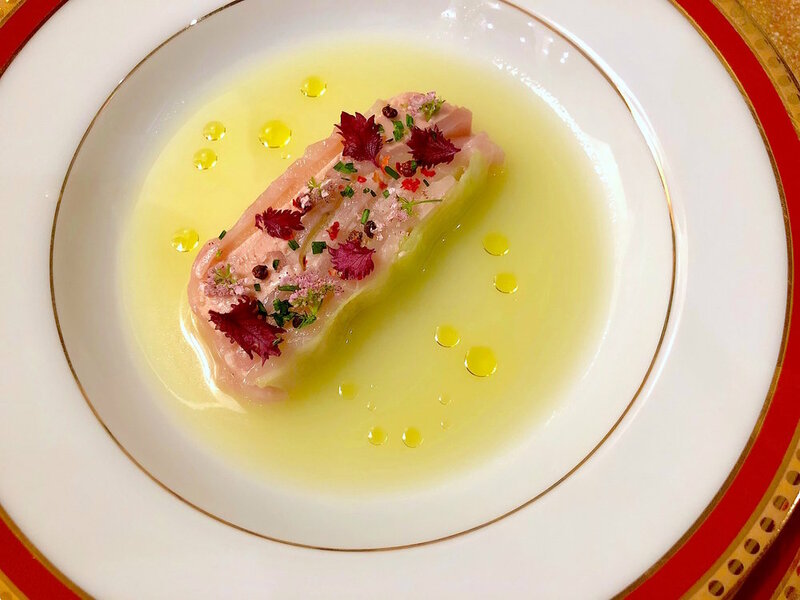 I was able to get my hands on white salmon or ivory and thought that I would make a terrine with the salmon, foie gras terrine, and the melon. I decided to take the scraps of the leftover melon and make a “broth” for the terrine. Now a days, for me, it is very hard to decide what to make for dinner guests. I get that people just want delicious food, but trying to decide who’s coming to dinner and sometimes I don’t know if people have allergies or not so I have to be sensitive to that when thinking about menus. But because foie gras normally will turn a lot of people off I actually gave all the guests the option for this first course. I gave them the option of this recipe or a watermelon gazpacho and in some cases I gave some people both. Here is the recipe I hope you enjoy it! This is for quick curing and smoking. I just wanted to add a little extra flavor to the fish and didn’t make this a day in advance so it was all done on the same day. I placed the salmon in square baking dish and placed the vinegar on top of the salmon along with the salt. I cured the salmon like this for 30 minutes. Then I rinsed off the cure. I place the salmon in a stove top smoker with iced packed in side to simulate a cold smoked salmon. I filled the smoker with wood chips and smoked it for 2-3 minutes. Then I turned off the heat and let it sit in the smoker for 30 minutes to soak up any of the residual smoke. Then place the salmon in the refrigerator for 45 minutes. Then take out and slice thin on the bias and set aside to assemble the terrine. In a terrine mold or loaf pan line the mold with plastic wrap allowing enough excess plastic to hang over the edges. Alternate layers of cucumber, then salmon, then melon, and foie gras. Continue that layering until you have used all of your ingredients or until your terrine is full. Wrap the left over plastic wrap on top of the salmon terrine. Place in the refrigerator to chill completely. You can weigh the terrine down or press it at this point with something heavy like canned food or something similar ( I normally have a thick piece of cardboard cut in the exact size of the terrine mold. I place that on top of my wrapped terrine, and place the weight on top of the cardboard. Place it in the refrigerator for at least 6 hours. Place all of the lemongrass, melon, and cucumber in a vita mix. Puree until smooth. Strain out through a chinois. Season the broth with lime and salt and place in the refrigerator until ready to use. Take out the terrine and unmold. Keep the terrine in the plastic wrap and using a sharp knife cut across the terrine and lay each slice down flat (You can cut this ahead of time and keep it on a plate in the refrigerator). Take the plastic off carefully and place in the center of the bowl. Season the terrine with fleur de sel, chives, shiso, and cilantro flowers. Then add the broth to the bowl. Finish with a little cilantro oil, serve and enjoy! Here is a recipe for dinner I made that was absolutely delicious. This was Mike Michelson who is co owner of the fantastic gourmet company Blis. You want fantastic gourmet pantry products? Blis is the one you need to start with for great aged vinegars, sauces and other fine condiment products. The maple syrup and vinegars are truly top shelf. Even though Mike was coming to dinner I don’t think I had a plan to use any of their products even though now looking back maybe I should have. I bought some chinese long beans at the farmers market and wanted to do a chinese inspired dish. I say chinese because of the flavors but some of the techniques and ingredients aren’t truly chinese. Here is the recipe I hope you enjoy it as much as Mike and everyone else! In stove top smoker place apple wood chips along with pecan in the bottom of your smoker. Place the chicken inside and cover. Turn on the heat and allow the chips to start smoking. Have the heat on for 1-2 minutes maximum. Turn off the heat and allow the chicken to stay inside the smoker for 30 minutes. Then take the chicken out follow the rest of the directions for curing and cooking the chicken thighs with the above link. If you are in a rush and don’t want to cure overnight try to cure for at least 8 hours. Place egg yolks, white wine, and ginger juice into a stainless steel bowl. Place over a double boiler or a pot with a little water in it simmering. With a whisk continuously stirring, whisk the egg yolks until they are thick and a airy but not scrambled. Take the bowl off the heat. Make a ring with a towel and place the bowl in the ring (this allows you to pour the butter with one hand and stir using the other hand without holding the bowl). Slowly pour in the butter, a ladle at a time stirring constantly. Season with salt, lime juice, and Korean flakes. Cover and Keep in a warm place. One trick for the long beans is to actually fry them for the 1 minutes. You can blanch them in salted water if desired but long beans have a very tuff outer skin. One way to get around that toughness is to flash fry or blanch fry. Instead of blanching them in the salted water you are simply doing a quick fry to tenderize the outer skin. Fry for about 45 seconds to 1 minutes. I would suggest covering the pan you are frying in because of the water content in the yard long bean you will have a big mess in your kitchen. Take out and drain on paper towels. Preheat oven to 400 degrees. Take your chicken thighs out of the duck fat once they have rested or completely cooled from the day before. In a hot cast iron skillet place the chicken thighs in the pan skin side down. You shouldn’t need any oil because there should still be a bit of duck fat on them. Cook in the pan for 1 minute and then place in the oven. Cook for 15 minutes until the skin is crisp and brown and the meat is hot all the way through. Meanwhile place the wheat berries in the small pot with chicken stock and some butter if desired. Bring up to a boil and cook for 3 minutes, season with salt and pepper and keep warm. In large saute pan add sesame oil, garlic, and ginger. Cook for 30 seconds and then add the flash fried long beans. Add the sambal chili paste and season the beans with salt (or soy sauce if desired). Cook the beans for 1-2 minutes until tender, hot, and delicious. Grab 3-4 long beans and place them in a circle in the middle of the plate. Then add a spoonful of the wheat berries in the middle of the plate. Take the chicken thighs out of the oven. Flip over the thighs and place one on top of the wheat berries. Finish the plate with the hollandaise, fried garlic, shiso leaves and cilantro flowers. Serve and enjoy! Here is a recipe I prepared last week for a dinner party with Mike Meldman, co owner of the casa amigos tequila brand. This was one of 6 courses I served on this particular evening. This was the only meat of the evening. Since Jp and a lot of others seem to be steering away from red meat I’m always look for alternative to serve in the poultry or game category. Here is a very french style quail recipe. Here it is I hope you enjoy it! For the mousse. Making sure all the equipment and food is very cold (place in the freezer for 15 minutes. Take some of the leg meat off the bone and place in the food processor along with garlic, and herbs. Puree until smooth, then while food processor is still running add egg white and then drizzle in the cream. Season with salt and pepper and then place in the refrigerator. Then for the quail breast. Place the deboned quail breast skin side down on your cutting board. (should be 2 breast from each quail) Then spoon or pipe the mousse in the middle of the 2 quail breast. Then using the plastic wrap and your hands roll the quail up into a tiny log with the skin on the outside the breast and filling on the inside. Using the plastic wrap roll as tight as can be and tie or twist up both ends. Then place in a sous vide bag. Repeat until you have all of the breast rolled filled. Seal up the sous vide bag air tight with 3 tbsp of butter. Place in the refrigerator for an hour to help firm up if you have the time. Other wise place in a 135 degrees water bath for 45-55 min. Then take out and rest. Place bones on a sheet pan and brown in an 400 degree oven for 30-45 minutes. Then take vegetables and brown in a stock pot with a little bit of olive oil until they are caramelized (15 minutes). Add garlic and herbs and cook for another few minutes. Then add bones to the pot along with the wine and reduce by half. Meanwhile deglaze the sheet pan with some water to get all of the bits from the roasting pan off and pour into the pot as well. Fill the pot with the rest of the water. Bring to boil and turn down to a simmer. Reduce by 3/4. Thicken the jus slightly with the cornstarch slurry by slowly pouring into the stock stirring continuously with a whisk. Cook for another 5-10 minutes. Season with salt, strain and set aside. Keep warm. Place baby turnips and the rest of the quail legs along with, garlic, herbs, and duck fat into a small pot. Bring to a boil and then turn down to a very very soft simmer. Cover and allow to cook for 20-25 minutes until the turnips and legs are tender. Set aside and keep warm. In saute pan add a little duck fat on medium high heat. Take the quail out of the bag and season with salt and pepper. Place in the pan along with the cooked legs, to brown on all sides (about 3-5 minutes). Take out and let it rest on a cutting board. Meanwhile place a spoonful of fennel puree on the plate with some of the roasted fennel and turnips. Cut each quail “log” in half. Place 3 halves on each plate along with 2 legs. Finish with some of the jus and garnish with fennel buds. Serve and enjoy! I was looking to make a vegetarian dish for dinner this evening and didn't get a chance to run to the market. I had these ingredients on hand so this is what came out. I love these types of salads where you have different textures and flavors with lentils, quinoa, and beans. Mix in some vegetables and other bold flavors and you have yourself a wonderful starter for dinner. Here is the recipe I hope you enjoy it! Place all of the ingredients except for the oil in a food processor. Turn on and puree, while the processor is still on slowly add the olive oil. Stop and scrap the sides if need by, season with salt and pepper once all the oil has been added. Pour out into a bowl and set aside for later. In a vitamix blender add all of the ingredients and puree until smooth. Adjust the seasoning with salt and pepper. Set aside for later. In a large bowl add equal parts, of lentils, beans, and quinoa. Add the roasted brussels and cucumbers. Add 1/4 cup of pistachio mint pesto and mix well. Add a touch of salt if need be. Add sliced radishes to the salad. Place a spoonful of aioli on the plate. Add the salad on top. Top the salad with truffles, herbs, micro greens. Serve and enjoy! This recipe is a little bit of Ying and Yang. It is basically two pasta dishes in one. Lemon and ricotta and Braised Beef with its jus. When I originally made this recipe it was a little bit of spring mixed with a little bit of winter. The inspiration is that time period during the spring harvest and weather turning from cold to warm. That moment when your almost out of winter but heading into spring and you want something a little light and a little heavy. Just getting back from Italy a few days ago this recipe really hits home with me because of all the pasta I had each and every day. You could also easily translate this from summer to fall. I love pasta and I hope you enjoy this one too! This time you want to fill with the pasta with the short rib filling but instead of using a continuous line of cheese filling we want to leave about a 1/8 inch gap every 1/2 inch to create the same size agnolotti as the cheese ones. Because the cheese filling is easy to manipulate you can make one continuous line but with the meat being cold and being meat it is a little easier to leave a space between each agnolotti (the space I/8 inch is where you will press your fingers to make the shape. Continue this the whole length of the pasta and repeat the same steps from above with the cheese. Place your beef agnolotti pasta in salted boiling water and cook for 2-3 minutes until they float to the top. Strain off and place in the saute pan with the beef sauce, add a touch of butter and season with salt and pepper, set aside and keep warm. Place your ricotta pasta in the water and cook for 2-3 minutes. Strain off the lemon ricotta pasta and place in a saute pan with cream, lemon juice, 1/2 cup of pasta water Let it simmer for 1-2 minutes and then add the rest of the butter to make a pan sauce. Season the whole pan with salt and pepper. Place 3 of each pasta in a bowl and garnish with basil and parmesan. Serve and enjoy! This dish comes from some leftover cauliflower mashed potato puree I had made from the night before. In the south of Italy they all kinds of pasta that they stuff with potato so I thought why not take the leftovers and fill some manti shaped pasta with it. 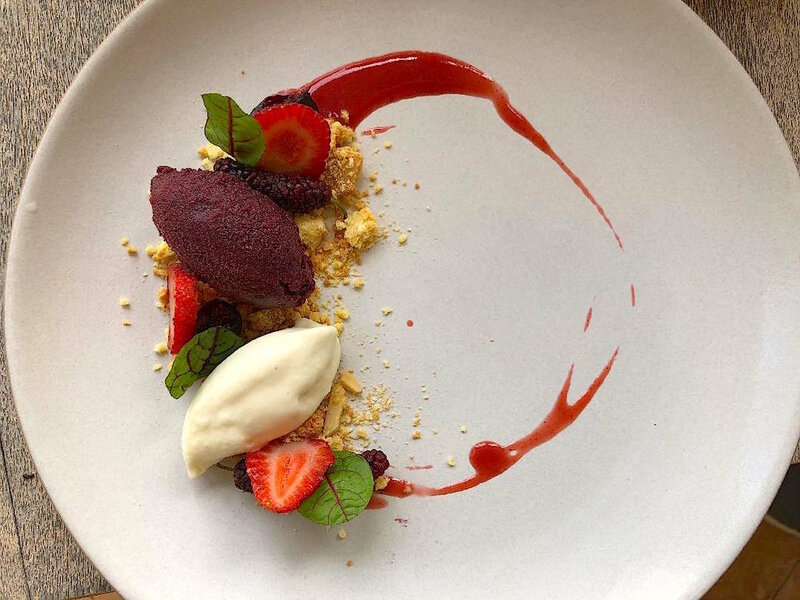 This is one way that not only restaurants but even you at home can take something already made and turn it into a whole new dish that no one will ever know, not even if you served the puree the night before. Here is the recipe I hope you enjoy it! Place cauliflower and potatoes in a small pot and fill with water. Add salt and bring to a boil. Turn down and simmer for 20 minutes or until potatoes are tender. Strain out the water well and using a hand blender puree the mixture adding butter and milk if needed. Season with salt and pepper. Use hot for another recipe, otherwise cool completely (overnight is best). Place leek tops in boiling salted water and cook until tender but still vibrant green (approximately 3-5 minutes). Meanwhile heat up cream in a small pot. Strain the leek tops and place in the vitamin with the hot cream. Puree until smooth, while the blender is still running add the butter. If the sauce is a touch thick you can thin out with a little of the blanching water. Season with salt and keep warm. Take your pasta and cut in half. Leave one half covered while you work with the other half. Take the half of the pasta with a rolling pin and roll until the dough is thin enough to fit inside the biggest setting on your pasta machine ( I use the kitchen aid attachment). Then run the pasta all the way down to the lowest setting twice. Dusting the dough with flour if it is too wet. Then on the third time run it down to the number 6 or 7 setting depending on the strength of the dough. Again, Use a little flour for dusting. If you feel like the dough is very strong and good density to it you might be fine with a 7 setting. If you feel like the dough is "loose" and doesn't have the structure to it then you might want to go a little thicker with a number 6 setting. One you have the flat pasta all laid out you can take an adjustable pasta cutter (here) and cut 1 by 1 inch squares. Then take your cauliflower puree and place in a plastic piping bag. Cut the tip off and place a small dollop on each square. Using a water spray bottle or a pastry brush, spray or brush lightly the pasta ends. Then taking one side of the square in each hand, pinch the two ends together one in the left hand and the other in the right hand. Then bring both hands to the cent pinch all 4 ends together forming a pyramid or a manti. Continue the process until you have all the pasta shapes made. It should look something like this. In a large saute pan add 1 tbsp of butter, olive oil, leeks and mushrooms. Cook for 3 minutes. Meanwhile place your pasta in salted boiling water and cook for 2-3 minutes until they float to the top. Strain off and place the pasta in the saute pan. Add a little of the cooking water to the pan along with the rest of the butter to make a pan sauce. Season the whole pan with salt and pepper. Then add some of the sauce to the bottom of the bowl. Add leeks and mushrooms around the plate. Add the pasta on top of the sauce. Finish with chopped truffles, flowers and olive oil. Serve and enjoy! 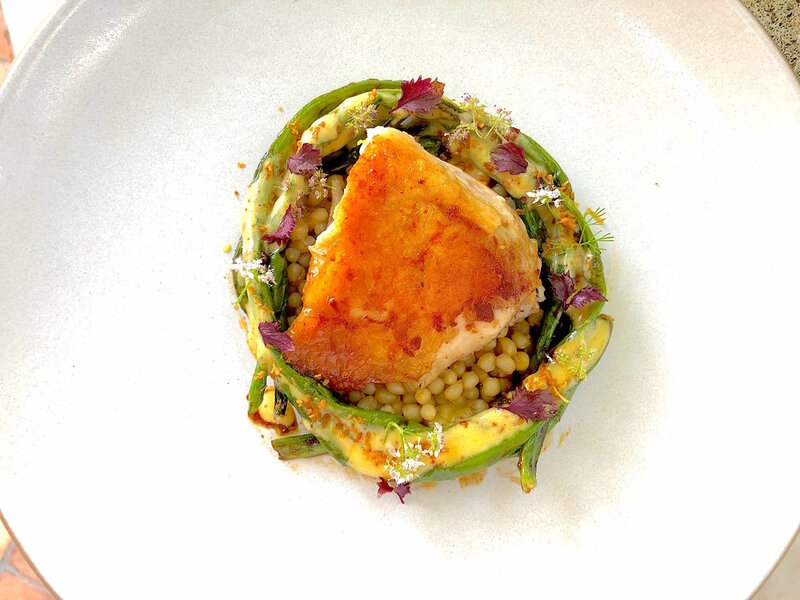 This was a simple dish using just a few ingredients and take a little extra time to present it in a "fancy" way. This is what summer eating should be about, less time in the kitchen and more time outside with friends and family. I served this recipe for dinner guests late this summer as tomatoes were still in full swing and melons become ripen. The garden had some amazing varieties of heirloom tomatoes that I normally wait until they are just ready to pick. Tomatoes really only need salt and olive oil when they are that fresh. 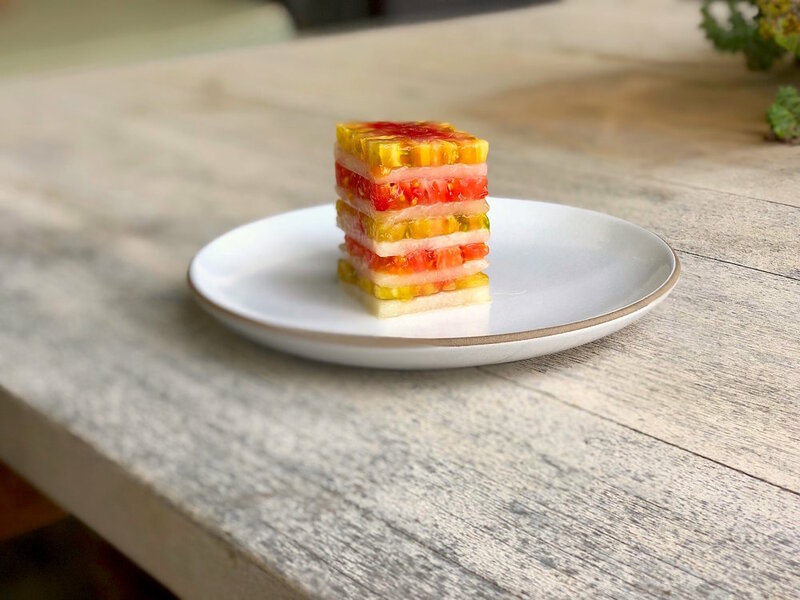 Melon and tomatoes are a perfect combination that go together seamlessly with little added flavors to compliment one another. In this case basil, olive oil, a really good aged vinegar and salt. Here is the recipe I hope you enjoy it. You will need a square pastry mold or something similar to have the shape of the terrine. I peeled and cut the melon into slices and then used the mold to cut perfect squares. I continued until the majority of the melon was cut into squares (Set the scraps of the melon aside to eat later or maybe use in a gazpacho for another recipe). Repeat the same process for the tomatoes insuring that you use only the center cuts of the tomatoes and not the skin. Once you have the perfect squares of each melon and tomatoes, alternate melon and tomatoes inside your pastry mold until you reach the top. Then carefully holding on the top remove the mold. I then carefully wrapped them in plastic wrap somewhat tight and placed them in the refrigerator until I was ready to serve later that evening. Repeat the same process until you have 5 terrines. You should have something that looks like this picture. Simply take all the ingredients for the salad and place them in a bowl. Drizzle lightly with olive oil and salt and set aside. Take the terrine out of the refrigerator and slice the terrine in half right down the middle keep the plastic wrap on to help keep the shape (continue with the others). Then after the terrine is cut place each half on a plate carefully removing the plastic wrap (should have enough for 10 servings). Drizzle the top with olive oil and salt. Place the salad next to it. Then add some of the age blis solera vinegar to finish the dish. Serve and enjoy! Here is a summer artichoke and truffle recipe. This is a fantastic vegetarian recipe that uses just a few ingredients. Artichokes can be a intimidating ingredient but it really just takes a little time taking the outer leaves away and peeling the green stem. Once you have done that you can remove the hearts on large artichokes. Depending on how big the baby artichokes are, you can sometimes leave the heart intact because of the maturity of the vegetable. This recipe is really simple in concept. You cook the artichokes in a flavorful broth, add some truffle and fat to the dish and that's basically the recipe. Jp absolutely loved this dish and hopefully you will too. Here is the recipe I hope you enjoy it! Take the artichokes and pull off the outer tough leaves of the large and small artichokes (wearing gloves helps you not to get pricked). Then take a pairing knife, cut off the tops and trim the bottoms of the green outer skin trying to keep the stem intact. Trim the stems as well of all the green tough skin. Immediately take one half of a lemon and wipe the artichoke all over to stop the oxidation process. Place in a pot filled with water, white wine, and 1 lemon juiced. Continue until you have all the artichokes peeled; the large artichokes should just be the bottoms and the small artichokes should have some of the inner leaves intact and you can cut them in half. Then add the rest of the ingredients along with salt to the pot. Take a piece of parchment paper and cut a large square. Then fold it over in half and then in half again. Then fold it diagonally into a triangle. Then fold two more times continuing the triangle. Then cut the point of the triangle off and cut around the outer edge to fit the size of the pot. Open the paper up (This is called a Cartouche), the paper should be a round circle that fits inside the pot with a whole in the middle of the paper. This is basically a lid for the artichokes to keep them submerged under the water. Bring the pot up to a slowly to simmer, where the water is just barely bubbling. Cook the artichokes until they are just tender all the way through. Test the artichoke with a cake tester to check the doneness. Take off the heat and let the artichokes cool to room temp. Take half of the small artichokes and place in a vitamix with cream, truffle, and oil. Puree until smooth and add butter salt and pepper. Take out and keep warm. Take the large artichoke bottoms and slice in 1/8 inch thickness. Place them in the pan with a little of the artichoke cooking liquid, butter, and olive oil. Take the baby artichokes and quarter them and add to the pan as well. You are just heating the artichokes up and seasoning them with a little salt if need be. Once hot, then add truffle puree to the plate. Add the sliced large artichokes on the bottom. Then add the quartered baby artichokes on top. Add sliced fresh truffles, tarragon, and amaranth to garnish. Drizzle with a little extra olive oil if desired. Serve and enjoy! This recipe you utilizes a classic condiment mustard as the glue that holds this dish together. The French cuisine has always loved mustard in their recipes whether it be on a fish, meat, sandwich, vegetable. I remember making this mustard crusted salmon over 20 years ago when I was just starting out in the industry. This take the old concept and takes more of a modern approach to the sauce. In a sauce pot on medium heat add butter to melt. Once the butter has melted add the flour to make a roux with a whisk. Once the roux has formed add the milk one cup at a time stirring constantly with a whisk. Keep adding the milk until a thick sauce has formed. Cook for 5-7 minutes on medium-low to cool out the flour. Then add the mustard and whisk in. Finish the béchamel with salt and more mustard if needed. Once it has been seasoned together pour into an isi canister and charge with 1-2 charges. Keep in a hot water bath to ensure the "foam" will be hot. Push a marrow cube into each one, followed by a dab of Dijon mustard, then cover with more of the mix. Place the croquettes in the freezer until hard, then press them out of the moulds. To Finish, Preheat oven to 275 degrees. In a large sauté pan add olive oil and turn on medium low heat. Season salmon with salt and place in the pan fillet side down. You want to cook the salmon very slow, after 2 minutes on the stove you can place in the oven for 6-8 minutes. Then take out and let it rest. You want the salmon to be rested, and an internal doneness of medium- medium rare center. Meanwhile in another large saute pan add butter, olive oil, mushrooms, and onions, Cook for 5 minutes and then add swiss chard. Cook for another 4 minutes and then add mustard. Stir well, Season everything with salt and pepper and keep warm. On a plate add mushroom mix to the bottom of the plate. Then take your isi canister with mustard béchamel and foam it over the top of the vegetables. Then take a piece of salmon and place on top. Add your marrow croquette to the plate. Finish with herbs and flowers and a drizzle of olive oil. Serve and enjoy! Here is a dessert that is a true winner if you want to take the time to bring it all together. It really doesn't take as long as the recipe ingredients look, but of course that is coming from someone who thinks everything doesn't take that long. The flavors are straight forward with banana, nutella, and caramel. All of these flavors go together so harmoniously without having to go above and beyond. The presentation looks amazing but that is deception using bomb molds. In short the recipe consists nothing more than a hazelnut banana "bread" (cake), banana cinnamon ice cream, banana and nutella mousse and caramel sauce. The end result is fantastic and I hope you enjoy this recipe! Mix all the ingredients well in a mixing bowl until you have one homogenous mix and then fill a 15 cavity half sphere mold (here). Freeze until completely solid. Take ripened bananas and puree until smooth with mascarpone cheese with a hand emersion blender. In a small separate bowl add gelatin and 3 tbsp of water to bloom. Meanwhile in a stand mixer add heavy cream. Using the whisk start to whip the heavy cream. When the cream starts to thicken add the powdered sugar and vanilla. Whip until stiff peaks. Place the whipped cream in a bowl and place in the refrigerator. Clean your mixing bowl out and place your egg whites inside ; make a quick meringue by mixing the egg whites on high with the whisk attachment and when the whites start to foam, slowly add 1/2 cup of sugar and whip until you have stiff peaks. Melt the gelatin over the double boiler and then pour into the banana mixture and mix well. Working quickly now fold in your egg whites in the banana mixture then fold in your whipped cream. You want to incorporate the whipped cream well, but you don't want to over work it. Then take 2 6 cavity bomb molds that are 3 oz each (here) and fill almost to the top. Once you have all 12 filled, take your frozen nutella half sphere mold out the freeze and place one half sphere in the center of each of the 12 banana mousse. Take an offset spatula and smooth out the top, you might need to add a touch more mousse to completely cover the sphere in the middle. Once completely smooth place in the freezer overnight to completely set up. Preheat oven to 350 degrees F. In a large bowl, combine flour, salt, nutmeg, baking soda, cinnamon and sugar. In a separate bowl, combine oil, vanilla, eggs, banana water, bananas . Mix wet ingredients into dry, add nuts and fold in. Pour on to a half sheet pan that has been sprayed with non stick spray. Bake for 30-35 minutes until cake tester comes out clean. Take our and let it cool completely. Once completely cooled you can refrigerate if desired and take a cookie cutter that is the same size as your bomb molds. Cut out 12 cakes for your 12 bombs and set aside. Simply place brown sugar and butter in a small pot and turn on medium heat. Cook until sugar and butter are melted. Then add the patron and flambé. Let all the alcohol cook off and then add the cream. Whisk until all is combined, cook for 1-3 minutes until you have the desired thickness and turn off the heat. Set aside until ready to plate. Place a round cake of the hazelnut down on the plate. Take a bomb out of the freezer and un-mold, place on top of the cake. Take ripe bananas and slice on a sheet tray. Then sprinkle liberally with sugar on the tops of the bananas. With a torch, caramelize the sugar on top of the bananas. Add some ground hazelnuts next to the bomb and add a scoop of banana ice cream on top. Then spoon some of the caramel on top and around the bomb. Add the hazelnuts on top and around the bomb. Finish with the caramelized bananas around serve and enjoy! NOTE: To make things a little easier and to not have the mousse so frozen, you can un-mold the bomb and place on top of the hazelnut cake and place that in the refrigerator until you are ready to serve the dessert. It will help serve everyone faster and it will help with the center not being completely frozen in the middle. I hope you enjoy it! Here is a recipe that took some great summer beets growing from the garden and turned it into a fantastic starter course for a lunch party. Beets is always one of those vegetables that has either been engrained into someones brain that they either love or hate. I can tell you that I have prepared beets many times and have had people tell me time and time again that they loved the dish but didn't like beets. I love roasted/grilled whole beets that are charred on the outside it is one of the easiest ways to get great flavor out of the beets without doing much to them labor wise. I think I was like most of those people where my mom didn't always use or cook fresh beets, she probably used the ones in a can that had that nasty juice on them or the pickled beets, I didn't care for either one of them. Both were unpalatable for me and most young kids. I think that scerneiro plays out with a lot us and now when we hear or think of beets, that situation of our childhood comes back to haunt most of us. This recipe might not be the dish that converts you to a beet lover but it is a fantastic dish with the spicy cheese, toasted raisin bread, and pickled vegetables. Here is the recipe I hope you enjoy it! Take a terrine or loaf pan and spray in the inside with non stick spray. Then layer the pan with plastic wrap or parchment paper so that it hangs over the terrine. Using a mandolin thinly slice the beets and rhubarb into the bowl keeping them separated. After slicing place an even layer of beet in the terrine pan. Then alternate with the rhubarb. After you have one layer sprinkle a little with salt and sugar. Repeat until you have filled up the terrine. Once you've filled the terrine, take the excess plastic wrap and fold over the top of the terrine. Place the lid on the terrine and place it in a preheated oven at 375 degrees. Cook for 50-55 min or until a cake tester can easily go to the bottom of the terrine without resistance. Take out and let it cool completely. Then place in a refrigerator overnight (you can press here if you desire by putting weight on top of the terrine. Un mold the terrine and slice into 3 oz portions. In a large saute pan add olive oil and butter along with the raisin bread. Toast until golden brown on each side. Season with salt and then cut into 3 pieces and place on each plate. Add the terrine slice to the middle of the plate and add a pinch of salt on top. Add the jalapeño cheese and pickled vegetables. Finish with nasturtium leaves. Serve and enjoy! June, 2018 in California was a busy time for the Dejorias, with dinner parties nearly every day. That makes it a busy time for me, too, and a challenge to think of a variety of menus. It also happens to be the month of JP and Eloise’s 25th anniversary. A few guests were invited for the evening. What to fix? JP was not eating red meat, and I had served fish many times in the week already. I didn’t want to serve chicken or run to the store for some other protein. Earlier in the week I had visited a local organic farm. I bought all kinds of vegetables and fruit, more than I actually needed, but summertime in California means abundance of fresh produce. Depending on the weather and month, you have many wonderful varieties of vegetables and fruit, week after week: berries, stone fruit, melons, squashes, blossoms, greens, peas, beans, tomatoes, mushrooms, citrus, onions, carrots, beets, salsify, corn, broccoli, asparagus, artichokes, potatoes, and I could go on. With so much to choose from, sometimes the hardest thing is actually deciding what to make. So I decided not to run to the store and buy a protein for the main course. This was one of the 5 courses I served that evening for the special anniversary dinner. Here is the recipe I hope you enjoy it! Place all the ingredients into a pot and bring to a boil. Turn down to a simmer and cook for roughly 20 minutes or until the hearts of palm are tender. (Time really depends on how thick and big the palms are). Once tender allow to cool to room temperature and you can pour all the liquid into a container to keep and preserve the hearts of palm. Place blanched chrysanthemum leaves and oil together in a vita mix and puree for 45 seconds. Then pour into a chinos and let it strain without pushing the pulp through the chinos ( let it drip that way you don't get any of the pulp in your oil). Take a one slice of yellow heirloom tomato and place in the bottom of each bowl. Season with a pinch of salt. Add slices of hearts of palm around the bowl. 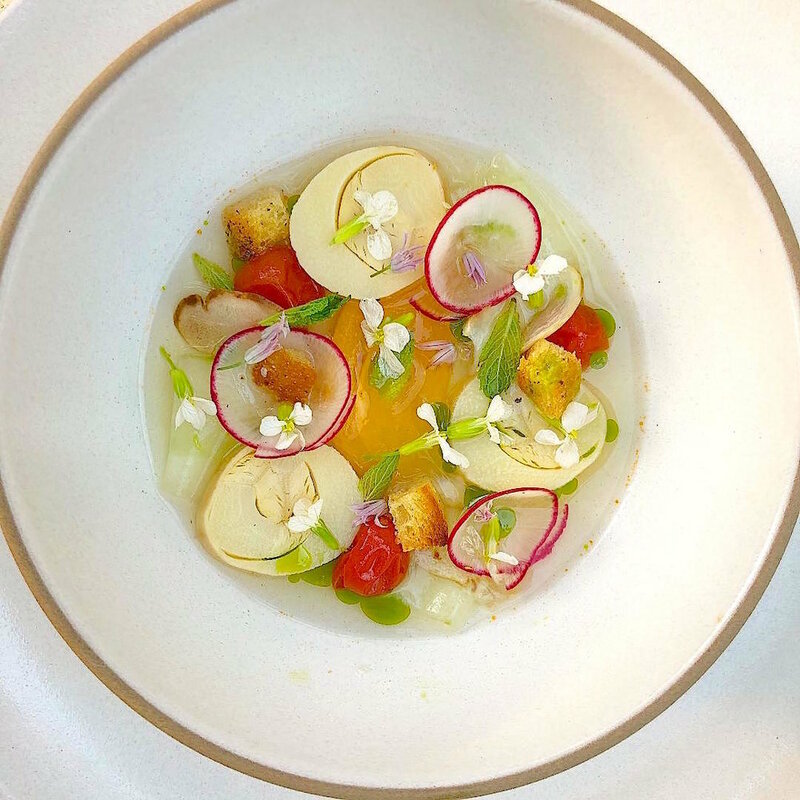 Add the roasted cherry tomatoes, the sliced porcini, and radish the bowl. Ladle 2 oz of tomato water to the bowl. Finish with herbs, flowers, and croutons. Serve and enjoy! Juice tomatoes in a vegetable juicer. Then take juice and place in a pot, heat over low heat. Simmer for 15 min until solids separate from the liquid. Remove from heat skim the pulp from the top. Then strain through a fine mesh strainer that is lined with cheese cloth or coffee filter. You should be left with a clear tomato broth. Then place tomato water back in the pot, add spices and cook for 5 minutes. Then stir in the butter and until smooth. Season with salt and keep warm. In two different pots one for the tomato and one for the mango. In a hot sauce pan add one tbsp of oil to each pan, and cook the onions with the ginger and garlic, cinnamon and star anise for about 3 minutes then add the raisins and mangos/and tomatoes for the other pot. . Add vinegar and sugar Bring to boil over medium heat, stirring occasionally. Reduce heat to medium-low and simmer until mixture thickens but some juices remain, stirring frequently, about 25 minutes. Remove from heat and cool completely. Then (Can be prepared days ahead.) Cover and refrigerate. Preheat oven to 425 degrees. In a stainless bowl add cauliflower and drizzle with a little oil and 1 tsp of curry and cumin, and salt. Place on a sheet pan lined with parchment and roast in the oven for 10-12 minutes. Repeat the same process for the brussels and carrots although they might need a few more minutes in the oven than the cauliflower (17 min for the brussels and 25 minutes for the carrots). In a small saute pan add olive oil and salt to the baby tomatoes. Roast them in the oven as well for 18 minutes. Take out and cool all the vegetables. Then in a large saute pan add 2 tsp of curry oil, ginger, garlic, and all the vegetables with the remaining spices 1 tsp of cumin, curry, cayenne, graham marsala. Cook for 3 minutes until hot. Adjust seasoning with a some salt if need be. Then portion out the vegetables in 4 separate bowls. Add 4 oz of tomato broth to each bowl. Top each one with the herbs and flowers. Finish with a spoonful of each chutney with the vegetables. Finish with another drizzle of curry oil around the bowl. Serve and enjoy!